Yea, that's basically what I'm like. So I've gotten real salty about Overwatch. 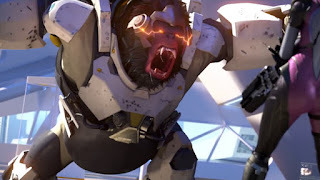 After playing some competitive mode matches today, I can say, without a doubt, Overwatch has made me more angry than any game I've played in the past ten years. My most recent surge of hatred came from playing a ranked match in a team with absolutely no one communicating. All team-based games require some communication to excel. If you ever watch the post-game League of Legends videos that show team chat during combat, you'll see the entire squad constantly shouting. It's not just the excitement getting to them. Communicating, even over communicating, is paramount. Being on the same page means you can single-target down the biggest threats, alert teammates of enemy positions, and rotate as a team for key objectives. League of Legends is a game with some higher-level strategy, where a lot of matches are won and lost by smart rotation and objective play, not just fast-button action. League also has communication tools built into the game, letting you receive and share information at a reasonable pace. Overwatch features none of these tools. You can tell your teammates that your ultimate is ready, but you can't ping where or when you plan on using it. You can't ping enemy movement, since there's no mini-map, and you can't quickly encourage someone to swap characters without typing in chat. You need to be on mic. At the same time, this isn't a simple shooter, despite what so many Overwatch players believe. Few people can hard carry in a massive and collaborative game of Rock Paper Scissors. So when I enter a match where no one communicates, even in chat, it feels like I'm playing alone, but with really terrible AI. For a game that relies so heavily on team play, that's a tragedy.